Pioneer settlers of Tolstoy Farm, 1910. Standing from right: L. Ramsamy, Ponsamy, L.M. Morgan, Venugopal Naidoo, C.K.T. Coopoo Naidoo and K. Devar. 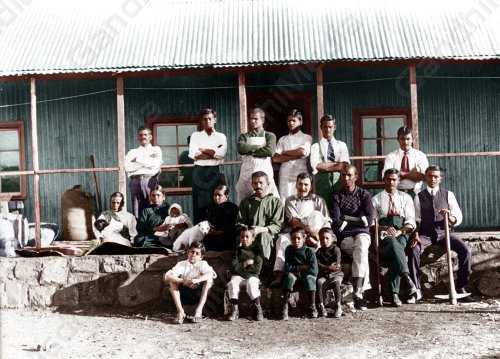 Sitting: Pragjee Desai, Rajee Naidoo, Joseph Roypen, Dr. Hermann Kallenbach, Mahatma Gandhi, Mrs. P.K. Naidoo, Mrs. Lazarus, Mrs. C.K. Thambie Naidoo. Third row: Bala, Bhartasarathy, Naransamy and Puckry Naidoo (all sons of Thambie Naidoo). Why is this picture in colour?